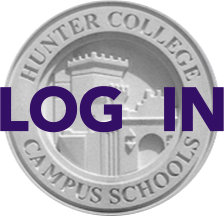 Roughly 220 Hunter students, family members, faculty and staff came to enjoy an evening of Korean food and culture at the annual Korean Cultural Festival held this year in Flushing, Queens on Saturday, Nov. 16. Participants learned a Korean folk song, wrote their names in Korean with brush and ink, and cheered as Hunter staff members modeled traditional Korean garb. Those were just a few highlights at the extravaganza, sponsored by the school’s Korean American Parents Association, the PTA, and the High School. The annual event is a "fun" raising event, bringing the school community together to share an exquisite banquet of traditional Korean foods, and to enjoy traditional Korean performances, games, and arts and crafts. 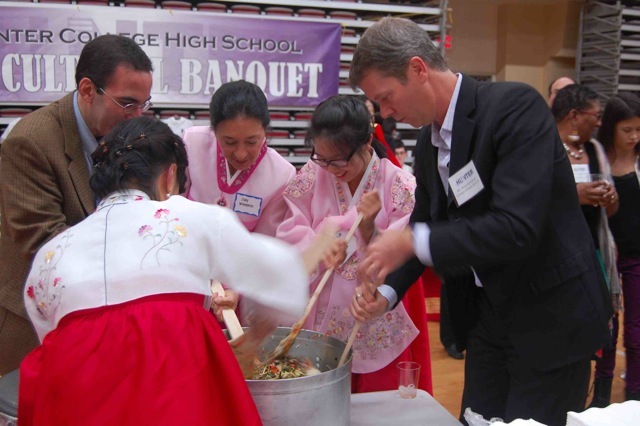 To the right, Dr. Fisher, Hunter PTA co-president Judy Weinstein, 12th grade student Sueun Hong, and HCCS director Dean Ketchum stir the many ingredients of the communal Bibimbop, Korea's signature rice dish, to kick off the banquet. Read more here.